Laser & IPL Equipment packages for every need and budget! 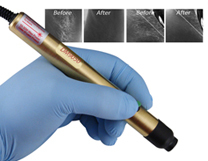 The DM-9050 has a full 9,000mW at 808nm making it one of the most powerful pin-point laser epilators you can buy. A convenient thumb switch activates the high-intensity pulses for the rapid destruction of hair follicle tissues and fungal infections. Laser module (150 Jmm2 808nm pinpoint beam), 1 laser power supply, 2 quantity of laser protection eyewear, 50ml carbon dye gel, 50ml of 3.5% lidocaine pre-treatment gel, 50ml of anti-androgen post treatment gel, tweezers and instructions. Laser light with the wavelength of 600 to 900 nm (nanometer) passes through human tissue with very little loss of intensity but reacts with extreme heat when striking melanin (pigment in the hair follicle) or carbon dye. This heat thermally desiccates and necrotizes the papilla and follicle in a fraction of a second. The result is the progressive and permanent reduction of hair growth activity in the treatment areas up. Any hair growth that may remain will be finer, weaker and lacking substantial pigment. Safety Information: Laser hair removal results in permanent destruction of hair follicles and is IRREVERSIBLE. Always plan ahead before you start, especially on hair line contouring and eyebrow shaping. This system is perfect for hair by hair or detail work. Advanced Nail Fungus Treatment System - Proven safe high wattage energy penetrates the nail, killing the Onychomycosis Fungus (or ganism responsible for the condition) without damaging human cells. - 77% see results in 1-2 weeks Clinically Proven. Restores healthy nail appearance, normalize thickened nails, reduce nail discoloration. Professional nail fungus treatment where fungicide carbon dye is applied to your finger or toe nails then the accelerator laser is directed at fungus under the nail to achieve fantastic results. This machine is many times more powerful than other systems and achieves measurable results in as little as three sessions. It is a very solid addition to the professional aesthetician's equipment base. 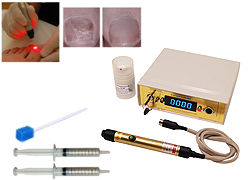 Laser module (150 Jmm2 808nm pinpoint be am), 1 laser power supply, 2 quantity of laser protection eyewear, 50ml carbon dye gel, 50ml anti fungal gel, blunt-tip syringes (to place the carbon dye gently under the nail) and instructions. The semiconductor laser diode is rated for an impressive 5000 hours of continuous use (about 3-5 years), so you know it will last. Laser output is delivered by a convenient thumb switch on the comfortable brushed metal module.